Crispy bacon paired with a simple fried egg set in between the folds of a fluffy, warm buttery biscuit– made from scratch! Today happens to be National Sandwich Day! And, I know you really want to celebrate. You need to go spread the word and celebrate this big day with all of your fellow sandwich lovers! So, let’s start today off with a breakfast sandwich! This is a short and sweet savory kind of recipe. This Breakfast Biscuit Sandwich happens to be one of my favorite sandwiches. It has the egg– fried, sunny side up, poached, scrambled…. you choose! Put some bacon slices on there. And, put it all inside of a freshly baked buttermilk biscuit– made from scratch, of course! You could even smother some Hollandaise Sauce on top (or inside), if you want to get a bit saucy! If you haven’t tried making my Buttermilk Biscuits yet. You better get on it. They are super easy to make (I promise!) and you can even freeze them individually. So much tastier than the can biscuit stuff…by far! What is your favorite sandwich you like to create? It’s a Sandwich Day to celebrate, you know! Follow the biscuit recipe. Pull open the baked biscuit and put your egg and bacon inside. *This sandwich recipe is for one. But the biscuit recipe makes about 9 medium sized biscuits. The biscuits may be frozen and pulled out of freezer to make these individual sandwiches. What a perfect way to celebrate national sandwich day! This biscuit sandwich looks soooo good. I want one for dinner! This breakfast sandwich is making me drool! I make one every morning for breakfast but it is not nearly as exciting as this one. It’s on a plain old English muffin. This is my hubby ‘s FAVORITE breakfast! Looks so tempting, Gloria! You’re so sweet, Kelly… thank you! I didn’t even realize this and had breakfast sandwiches today too. So funny, Deborah! You celebrated with not even knowing you were celebrating! My boys LIVE on sandwiches as snacks….all day long. They’ll put anything in between two pieces of bread….even spaghetti! Then they might love the new hamburgers restaurants are doing by making the pasta the buns. It’s very interesting. I would wake up early for this!! Having a breakfast sandwich is one of my favorite ways to start the day, I just had one this morning! Yours looks delicious! Thank you, Pamela! I love breakfast sandwiches, too. I think I prefer them more than a regular kind of sandwich! Have a great Monday! I love a good breakfast sandwich. I’d have this anytime breakfast, lunch or dinner. Looks great! Me too, Norma. Sandwiches are so delish! Have a happy Monday! I have a hard time trying to decide if I want my breakfast sandwich to be with an english muffin or a biscuit. But, it would be an EASY decision if I had these buttery flakey biscuits in from of me!! Love this breakfast sandwich! I love making breakfast sandwiches on the weekends. 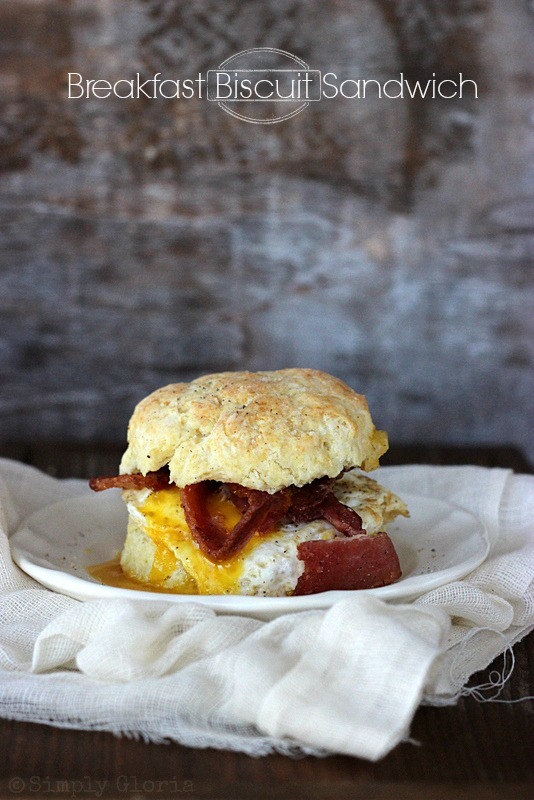 This biscuit sandwich looks so perfect, especially with the bacon! Oh my! It’s (belated) National Sandwich Day and I want to come over to your house to celebrate Gloria! 🙂 I love a good breakfast sandwich and fried egg with runny yolk is a must for me. *SWOON*! And pinned! Have a great week my friend! Oooooh how I want to wake up to this loaded biscuit sandwich every morning!!! Ahh breakfast, my favorite meal. I may need to make one of these lovelies for breakfast tomorrow. The protein shake can wait for another day 😉 Pinned! I love a biscuit sandwich and your’s looks to-die-for!!! Egg and bacon on a hot biscuit get in ma belly!!! I want!! You always make me laugh, Elizabeth! I always find it so interesting how foods have different names from all over. Let me know when you give it a try with all the breakfast inside of a “scone”, Linda! Look at you with your cute little sandwich! I did not know that 11/3 was national sandwich day. I’m trying to think, did I eat a sandwich that day? No, I did not! I was busy making my mock Thanksgiving meal. This looks delicious, Gloria! Pinned. Thanks for sharing on Marvelous Mondays! Jocelyn, I’ll trade you for one of those White Chocolate Peppermint Mousse Cheesecakes! Oh that is one yummy looking breakfast sandwich! I would totally be a morning person if that was waiting for me. This is calling my name, Gloria! I LOVE biscuit sandwiches for breakfast, and this one looks exceptional with the bacon and runny egg. Thanks for sharing it at Saturday Night Fever. I think I’ll be pinning this one a few times..